My mother moved into the Reflections Retirement community. Theyve been very attentive to her needs, shes happy where shes at, and I have had no problems. Its clean, they do have quite a few things in the building to do, they have activities, and people come in to entertain and do things with the residents. The room is a good size, and right for her. They have a library, they show movies, they have games, puzzles, and they do little day trips. Its a very nice place and Id recommend it to other people. Sheryl, thank you for sharing your recommendation of our community; we appreciate your feedback and we're so pleased that your mother is enjoying her home here with us! My dad moved into Reflections Retirement. I like the appearance and hominess of the place. It's not too large and they're very attentive to their residents. They do exercises, listen to music, play Bingo, do puzzles, and play some games. They do a lot of activities with the residents. The food looks good, and he doesn't complain about it. It's very economical and priced right. Beautiful community with friendly staff and residents. Betsy, thank you for taking the time to provide a review of our community. We appreciate your feedback and we're so pleased that you enjoyed your visit with us! I visited Reflections twice, they had a lot of activities, and they had most of the things that I wanted. The rooms were OK, and they had an on-call doctor and nurse. The staff was very good and very nice. Most of the residents looked pretty happy, they were doing things, there's a place to walk around, and there's a little pond where kids could go fishing. We are so glad that you enjoyed both of your visits to Reflections Retirement Community of Lancaster, Ohio. Our 24 hour nursing, great relationship with local doctors and engaged staff are some of our most valued assets. However our driving force is quality of Life for our residents and we take pride in our busy happy residents. Please come join us again for an activity or lunch. The rooms at Reflections Retirement Community were spacious. The place was clean. The residents were well taken care of. It had a nice dining area and a coffee bar area where people could go and hang out. The staff was really nice. Reflections were all very nice. The only drawback was the laundry was not in the same room, and my sister can’t carry her laundry down. She is independent, but she has to have everything in the same spot. She still likes it and still wants to live here, but we will have to wait and see as she changes her mind everyday about moving. They had a lot of activities going on, and the people were happy as I talked to some of the people. The meals looked good, and that was encouraging to my sister. The cost did include dinner, and that was nice. It was also beautiful to where it was located. Thank you for review and comments. I am so excited to let you know that Reflections is now offering “Living Well” services which would be perfect for your sister. These services would allow us to carry your sisters laundry to and fro to the laundry room for her or just do her laundry weekly. I am so glad she is interested in our activities and would welcome her to come join us and experience any of our activities and lunch at her convenience. I welcome the opportunity to discuss in more detail how we can come along side you to help your sister. Please call me at (740) 653-1423 or e-mail at kkraft@seniorlifestyle.com , as I am very interested in speaking with you. Reflections Retirement Community was nice. The apartment I saw was a two-bedroom with a living room/kitchen combination that I thought was very nice. The staff was very nice, and I liked them all. The food was good. My 91-year old mother-in-law has been in Reflections Retirement Community for 14 years. The staff are very accommodating. They have a very nice dining facility. They have very nice rooms - you can have a one-bedroom or two-bedroom units and studio apartments. They have independent and assisted living. Reflections was a wonderful, very nice, and clean place. The staff was wonderful, nice, and friendly. On the 1st of October, I'll be moving into Reflections Retirement Community. I choose this facility for the price and for its proximity to my doctors. It's the most reasonable one I found and it meets all my needs compared to other facilities. It is close to the grocery store and the hospital. It is just convenient for me all the way around. The facility itself is clean. They have a walking path and a pond there. They offer activities for their residents. They have day trips for their residents all the time, exercises classes, etc. They take you to the doctors or to the grocery store if you want them to. They have a library and an atrium, where you can sit and play cards. They have an area set aside where you can do puzzles. They have an exercise room and they have a therapist that comes in to give you therapy if you need it and such. They have laundry facilities that you can either have them do it or you do it yourself. Regarding accommodations, most apartments there are one- and two-bedroom apartments. I have an apartment with a bedroom, a living room and a kitchen with a dinette. I can fix my own breakfast in my kitchen. They will be providing my lunch and supper though. They will give you a menu a week ahead and then you have three choices of your entrees, two choices of your side dishes, and then you have a dessert, a salad, and drinks. They even have a 24-hour fruit juice bar for their residents. Every staff members I met there was very friendly and very helpful. They do have a nurse on duty too. There's always somebody there to assist you in what you needed. This was the facility that we think suited us best. The staff was very friendly and helpful. The rooms were nice. I'm pretty satisfied with them. My grandma lives here at Reflections. She started out in one of the Independent Living wings. She then got ill and had to go to the hospital. What I loved about Reflections was that they helped us make such a seem-less transition to the Assisted Living wing when grandma was ready to come back to her home at Reflections. The staff was over the top helpful, kind and caring from top management, office staff, nursing, aides, housekeeping and even maintenance, They all had a hand in helping with the transition and making it so simple for my family and my welcoming grandma home. We couldn't be happier or more pleased with our choice of Reflections!! I was a resident of Reflections a little over two years ago. I liked it very much. I had a two-bedroom apartment that they let me decorate it any way that I wanted to, including painting the walls. It was nicely laid out and very handy for me to get around in. I liked the dining room very much. It was nothing fancy, but it was nice. Once in a while, the foods wasn’t so hot, but most of the time it was good. The activity director tried to have all kinds of activities and had a good selection of activities. On Wednesday evenings, a minister would come and have church services, which was always nice. They had a beauty parlor in which they do a very good job and was reasonably priced. They had a room that you could go and do exercises in, a library, and a walking path all the way around the building with a good-sized fish pond out back, which makes it very nice. Describe the overall population of assisted living residents at Reflections Retirement Community. What is their average age? What are their favorite things to do? What programs or activities does Reflections Retirement Community offer to enrich residents' well-being? We have a walking path, pond, birth watching club, coloring and puzzle tables, book clubs, exercise classes, bible studies, bingo, games, visiting bands, musicians, choirs, monthly greeting meetings and birthday parties. What places are near Reflections Retirement Community or within walking distance for assisted living residents to enjoy? We are just one street over from the main drag where all things good are in Lancaster Ohio! We take weekly shopping trips for all your needs. What transportation services does Reflections Retirement Community offer to assisted living residents? We have a bus for weekly shopping trips, medical transport or fun outings. What makes the chef or dining program at Reflections Retirement Community exceptional? What kind of menu can assisted living residents expect? Our dining service director has been here for 16years and prides herself in making great homemade soups. Our menus is home style with two entries to choose from per meal daily. How does Reflections Retirement Community keep residents' families informed about their loved ones? At Reflections we all staff have an open door policy. Care concerns and conferences are held with the Health and Wellness director who oversees all care and resident assessments. What is the care staff-to-resident ratio at Reflections Retirement Community during daytime and nighttime hours? We have 24 hour nursing and care givers on site. If Reflections Retirement Community accepts dogs or cats, what indoor/outdoor areas can they enjoy? We accept animals under 25 lbs. We have a walking path. monthly training classes are provided as well monthly fire drills, safety meetings and disaster drills. Describe the overall population of independent living residents at Reflections Retirement Community. What is their average age? What are their favorite things to do? What are some recent off-site events that the community activity director at Reflections Retirement Community has organized? What transportation services does Reflections Retirement Community offer to independent living residents? What makes the chef or dining program at Reflections Retirement Community exceptional? What kind of menu can independent living residents expect? Our dining service director has been here for 16 years and prides herself in making great homemade soups. Our menus is home style with two entries to choose from per meal daily. What safety features or security measures does Reflections Retirement Community offer to independent living residents? Senior assisted living at Reflections Retirement Community offers residents the best of both worlds. All benefits of our senior living community are combined with a full spectrum of senior care services to create a premier senior assisted living community. Residents enjoy beautiful surroundings, on-site amenities and social programs alongside continual on-call medical care. At Reflections Retirement Community, we adhere to state-of-the-art standards of senior assisted living while providing a special touch. Our residents receive personal and comprehensive care and are consistently treated with the dignity and respect they deserve. Whether our residents need help with day-to-day activities, getting to appointments, or medication management, our caregivers kindly and competently meet those needs. 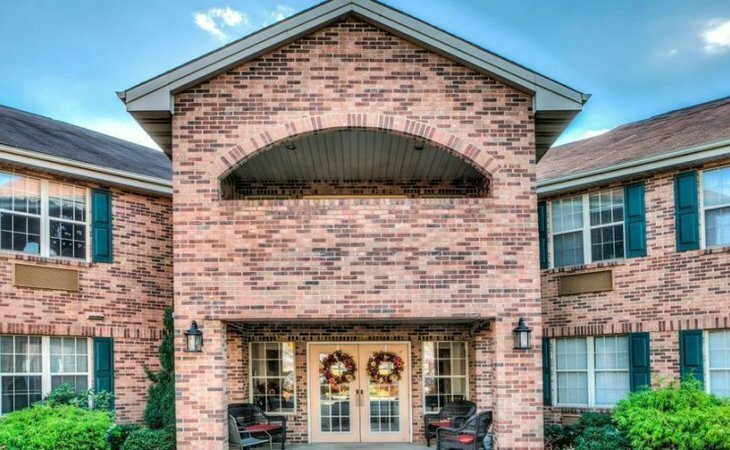 Our assisted living community in Lancaster has been purposefully designed to provide you or your loved one with a nurturing, comfortable, home-like environment that is attractive and easy to navigate. We foster community and family by hosting many activities and events each month. Residents are encouraged to participate in as many pursuits and outings as they like, appropriate to their ability. No matter what, everyone is treated as an individual person with unique needs. At Reflections Retirement Community, our residents live life to its fullest as they age in place. Reflections Retirement Community offers independent living in Lancaster for seniors who are able and inclined to live independently, but crave the comfort, security and social opportunity a retirement community offers. On-call assistance and maintenance-free living means you never need worry about anything but living life to the fullest! Just steps from your front door, you'll find easy access to a media room and a wide assortment of activities, as well as special events and regularly scheduled outings into the community. If you are looking for a vibrant, active place to call home during your retirement years, Reflections Retirement Community will fulfill your desires. Come visit us and see how great senior independent living can be. What should caregivers and potential residents know about Reflections Retirement Community?